A bit hard to find, Cosima is well worth seeking out for a culinary adventure. : Cosima, named after executive chef Donna Crivello’s grandmother, fills a renovated old boiler room in the historic Mill No. 1 building and also offers al fresco dining overlooking the Jones Falls waterway. 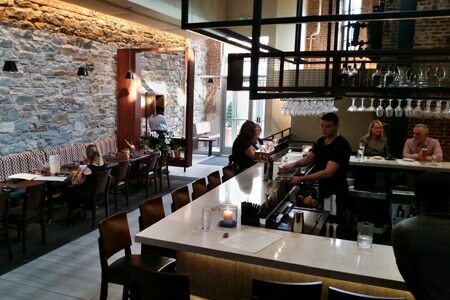 The painstaking redo of the mill into this bi-level southern Italian/Sicilian restaurant, with a cobblestone entrance, exposed stoned and brick walls, blends well with the contemporary décor. Cosima’s wood-fired-oven flames lick at the handcrafted seasonal pizzas, like the con fiori di zucca with squash blossoms, goat’s cheese, asparagus and heirloom tomatoes. One can choose from small plates: grilled baby octopus over a salad of potatoes, celery, red pepper, capers and anchovy vinaigrette; tuna crudo, oranges, pickled fennel, crispy capers and Calabrian chili aïoli. Pastas include house-made cuttlefish ink fettuccine, grilled half lobster and charred tomato lobster sauce. Watching your carbs? Try the grilled branzino with kale salad or porchetta with arugula, pickled pears, fennel and black garlic aïoli. The wine list stays true to its Italian roots with labels from Puglia and Sicily, and selections are available by the glass and bottle. Featured cocktails all contain an amaro, but the bartenders can whip up any concoction you desire. Don’t miss the house-made desserts, such as Sicilian donuts, gelato and the orange-pistachio olive oil cake.